I remember going to see The Lost World, the sequel to Jurassic Park, on opening day in 1997. I was only a lad, but I already knew quite a bit about movies. I had seen my fair share of classics, and I had some legitimate criteria with which to separate the wheat from the chaff. I had read Michael Crichton’s novel, The Lost World, and after four years of obsessing over Jurassic Park, I was fully prepared to love the film sequel. When the lights came up and the credits rolled, I was thrilled. Sure, it was a heck of a lot different than the novel, but it was still absolutely awesome ... or so I thought. Telling people about it the next day, my level of enthusiasm had dwindled a bit. The day after that, I was even less sure, and by the time I saw it again four or five days after the initial viewing, I realized that The Lost World wasn’t as good as I first thought. In fact, it wasn’t good at all. It didn’t follow the plot of the book, the pacing was off, the characters weren’t lovable, and the sense of wonder from Jurassic Park was gone. How the heck had I been fooled the first time? As I’ve grown older, I’ve encountered many situations akin to this one. I’ve been aware of the phenomenon for quite some time, but I haven’t put a name to it until now. Like an actual sugar rush, the cinematic Sugar Rush Effect can sweep in unexpectedly, give you a buzz, and then leave you feeling empty and exhausted shortly thereafter. You could fill a video store with these movies, most of them action pictures that bombard you with explosions, thrills, and special effects. Amidst the assault on your senses, you may be fooled into thinking you’re having fun. As a film critic and appreciator, understanding this phenomenon has been important. I often let a few days pass between seeing a movie and writing its review. I’ve made the mistake in the past of coming home from the theater and writing a review immediately, only to realize later that I had been too kind to the movie. The critique remains forever frozen in time: a picture of me still high on the buzz of a busy movie. My review of Spider-Man 3 is a prime example. If I had waited a few days, that review would have been a lot harsher, and consequently, would have been more accurate. But then again, what if it’s not the Sugar Rush Effect and you really are being entertained? Time is the best test, but sometimes, you just know right off. Audiences were amazed upon seeing Jurassic Park in 1993. It didn’t just change the film industry by blowing the computer-generated doors wide open; it was also one hell of a fun movie. People went back for multiple viewings, and by the end of its run, it was the highest-grossing movie of all time. My parents let me go see it during its last days in the theaters, and I’m so thrilled to have experienced it on the big screen. I was only nine years old, but I knew I wasn’t just seeing some fluff piece that happened to have great effects. I was witnessing one of the greatest blockbusters of all time. 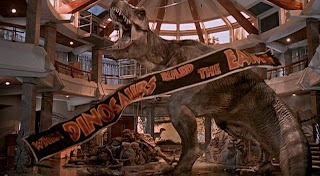 Sixteen years after that first viewing, Jurassic Park is still magical to me, whereas four days after The Lost World, I was left with nothing. Jurassic Park’s amazing CG effects wowed audiences in 1993, but it was the screenplay, actors, and direction that really made the film great. The Lost World introduced me to the Sugar Rush Effect. It provided a brief thrill, but once the script diverted from the story in the novel, the substance got sucked out and the movie never recovered. What’s most interesting, though, is that I needed a few days before I could see the movie for what it really was. Disney’s Pirates of the Caribbean trilogy demonstrated the difference for me between solid adventure films and Sugar Rush experiences. I loved the original film at once; I didn’t need a few days to understand and appreciate how fresh and fun it was. Pirates of the Caribbean: The Curse of the Black Pearl (2003) was a blast, full of memorable characters and swashbuckling fun. When I saw the sequel, Pirates of the Caribbean: Dead Man’s Chest (2006), I wasn’t nearly as sure. I needed time to process. After waiting a few days, I realized that I really did enjoy it. It proved to be a Sugar Rush movie for many, but I appreciated the plot twists and unexpected character development. When the test period ended, my thumb was still up. The Sugar Rush Effect finally came into play for me with Pirates of the Caribbean: At World’s End (2007). Here it was: the wham-bam, in-your-face adventure that didn’t have nearly enough genuine fun supporting it. Every time I watch the first film, I just have fun; I smile and laugh. 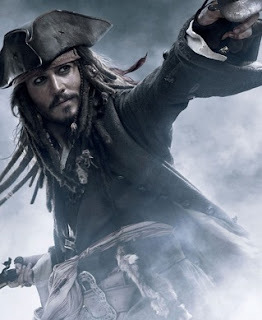 With Pirates 3, I wrote my review too soon, and a few days later, I regretted that decision. I should have called the shots a little tougher. Not everyone falls prey to these Sugar Rushes. Some people immediately understand the full value of what they’re seeing, though I often need a little time to process. Also, it’s important to remember that not everyone will agree on which movies are substantial and which are fluff. Many of my friends have cited The Matrix Reloaded (2003) and Star Wars Episode I: The Phantom Menace (1999) as Sugar Rush experiences, whereas I still enjoy those films and will defend them (within reason). I’m slowly learning to integrate this need for reflection into my analyses, and it has already made a difference. I had mixed feelings shortly after seeing Transformers: Revenge of the Fallen. Three days later, when I wrote my review, my mind had been completely made up. Because of my awareness of the Sugar Rush Effect, I’m no longer afraid to take my time, and I’m no longer afraid to change my mind. The next time you see a big, special effects-packed spectacle of a movie, try sitting on your opinions for a day or two and see how they change and develop. Your opinions may not change, they may improve, or you may just find yourself snapping out of a sugar-induced trance.